Stamina and Style? 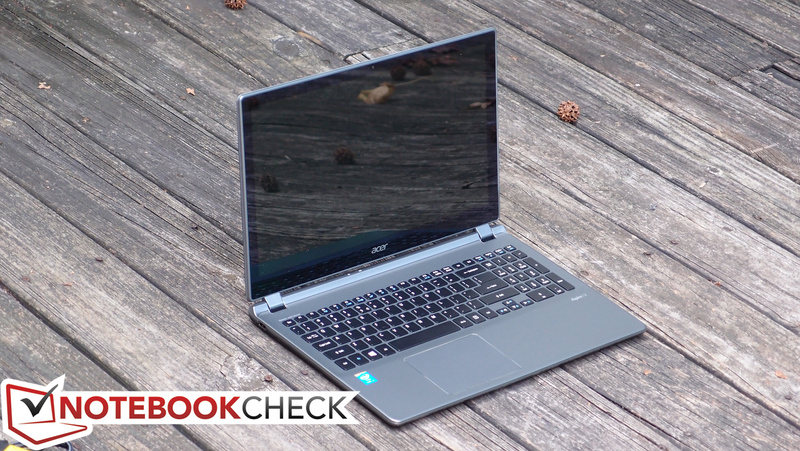 Acer’s latest touchscreen-equipped Ultrabook might seem a bit large for its sake, but its promise of great battery life and strong performance make a compelling argument nonetheless. Is it worthy of consideration? Acer’s new V-series notebooks span a wide range of prices and specs, starting with the ultra-affordable Aspire V5-121-0452 (just $299) and topping out at the $1,049 Aspire V7-582PG-6421. 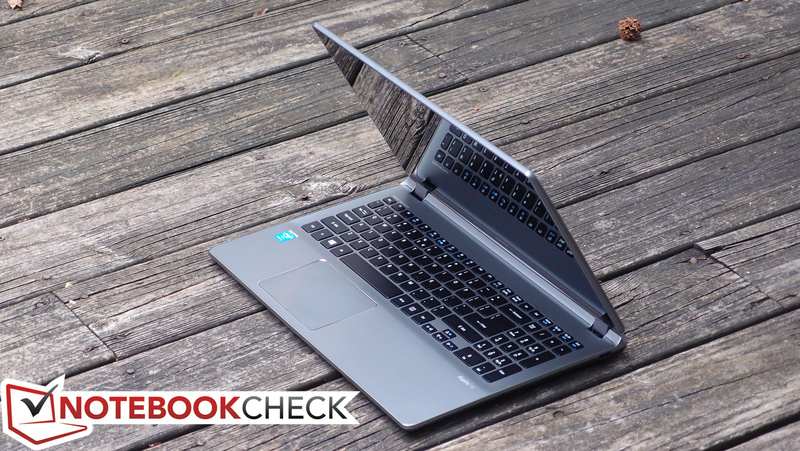 Both the V5 and V7 classifications (in contrast to the more traditional V3 models) focus on thin-and-light designs meant for a variety of budgets, and the notebooks range in size from 11.6-inch all the way to 15.6-inch. While the top-end V7 features a 1080p IPS touchscreen, dedicated 2GB nVidia GPU, and double the storage space, our review unit—the V7-582P-6673—steps it down to a standard 720p panel with integrated graphics and saves $200 in the process. 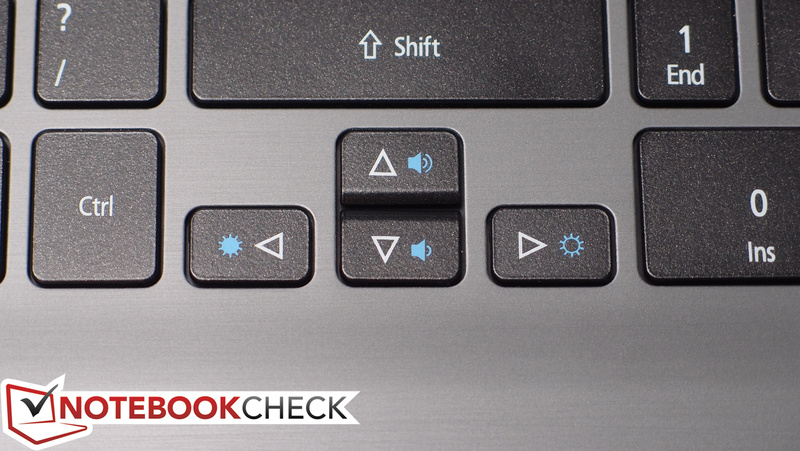 Still, it’s no slouch in the context of modern mainstream Ultrabooks. Sporting an Intel Core i5-4200U Haswell CPU, 8 GB of DDR3 RAM, and integrated Intel HD Graphics 4400, it’s hardly a low-end proposition. 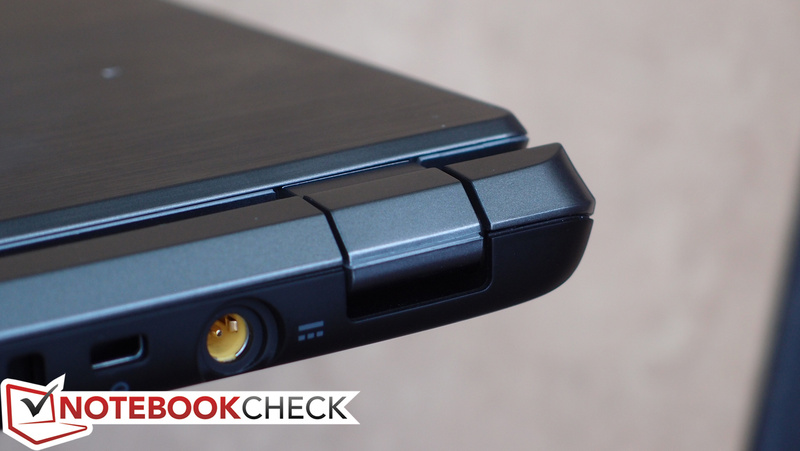 Plus, battery life (thanks in no small part to the Haswell CPU) promises some surprises. But at $849, how well does the full package stack up against its competitors? Let’s get down to the facts. The Aspire V7-582P (available in four different colors) is constructed from a combination of brushed aluminum and plastic, though by appearance alone the like-colored materials tend to blend together quite seamlessly. 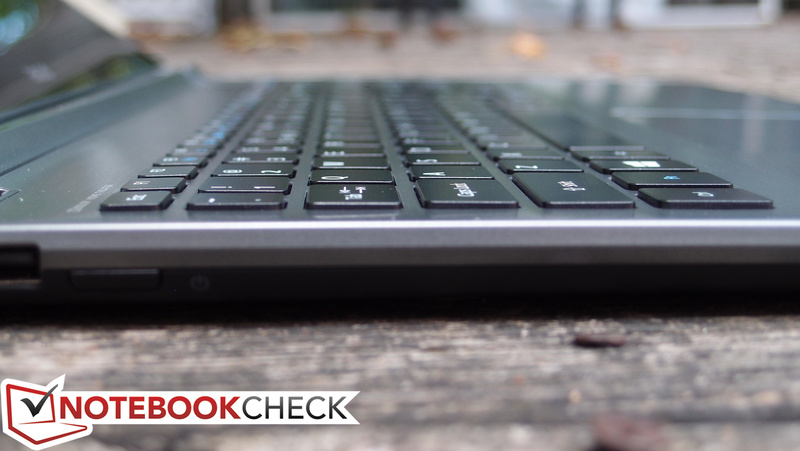 For the most part, the frame of the notebook is plastic, while the display lid and palm rest (including the keyboard surround) are lined with metal. Nevertheless, the notebook initially feels solid and sturdy, with very little flex on the base unit apart from response to heavy pressure in the center. This is in spite of its fairly light 2.22 kg (4.9 lbs) weight, which is good for a 15.6-inch notebook, but still substantial in the world of Ultrabooks. The material on the bottom of the machine, meanwhile, features a soft-touch finish and feels rigid enough to last. 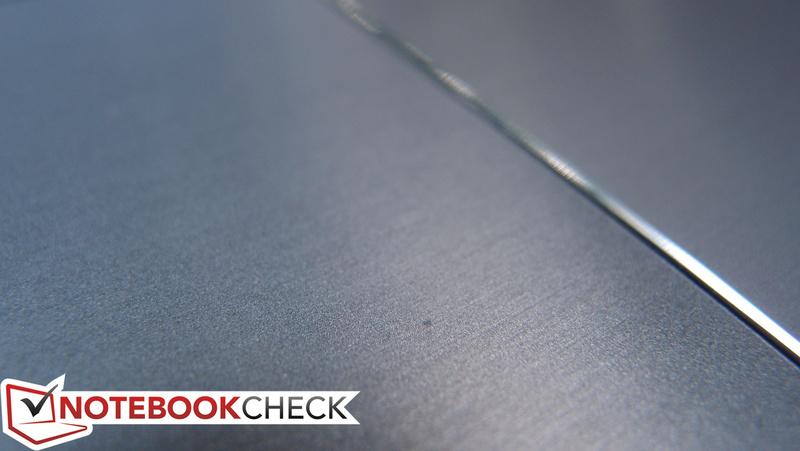 Unlike the rest of the silver-colored body, it’s entirely black, and it extends halfway up along the sides of the notebook to meet with the grey plastic trim. The weakest point is the display lid, which—while sufficiently thick—still feels rather flimsy and fragile. 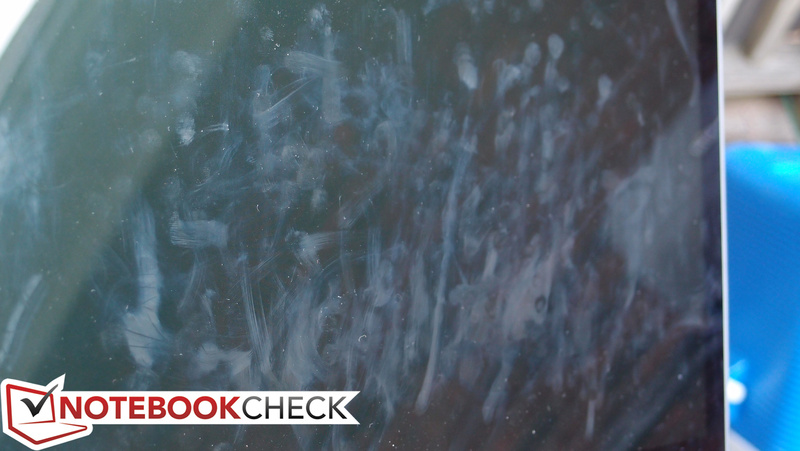 Pressure on the back of the lid produces significant LCD distortions, and hard taps on the screen result in a rippling effect near the left and right edges of the panel. 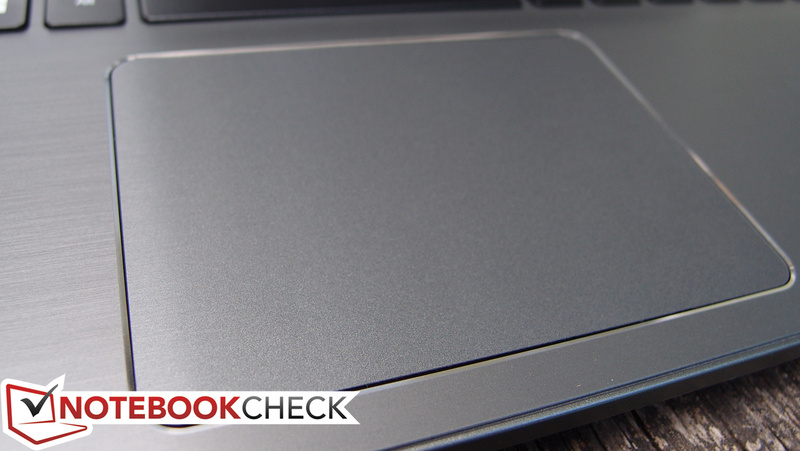 The lid itself seems to provide acceptable torsion resistance, but is a far cry from the much more durable offerings of many high-end Ultrabooks and business models. On a related note, the hinges—while certainly firm enough to hold the angle of the screen constant—can’t prevent the screen from suffering a slight wobble while the touchscreen is in use. It’s a minor problem, but one which afflicts many larger touchscreen notebooks. Overall, the workmanship is very good; apart from a few niggles, there aren’t many other gripes about the design—though we'll list our last few: any slight amount of pressure on the left palmrest of our review unit resulted in a faint clicking sound as the parts compressed slightly, which was annoying while typing at times. Also, the placement of the power button along the left edge of the notebook hardly seems ideal, and maintenance is a bit inconvenient. As is the case with many Ultrabooks, the battery is internal, meaning that replacement would require removal of the entire bottom of the notebook (and a couple dozen screws). A “battery pull” button is fortunately provided on the bottom of the base unit (recessed into the case). 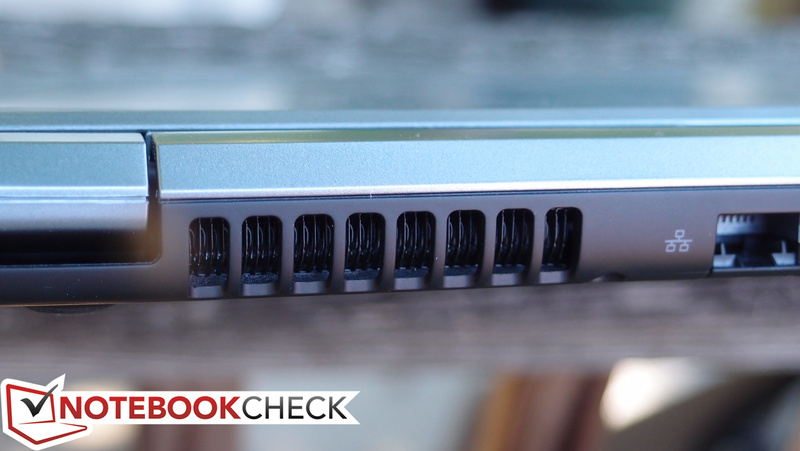 The V7 features a commendable array of ports for a 15-inch Ultrabook, with two video output options (HDMI and mini-DisplayPort), Gigabit Ethernet, and three total USB ports. 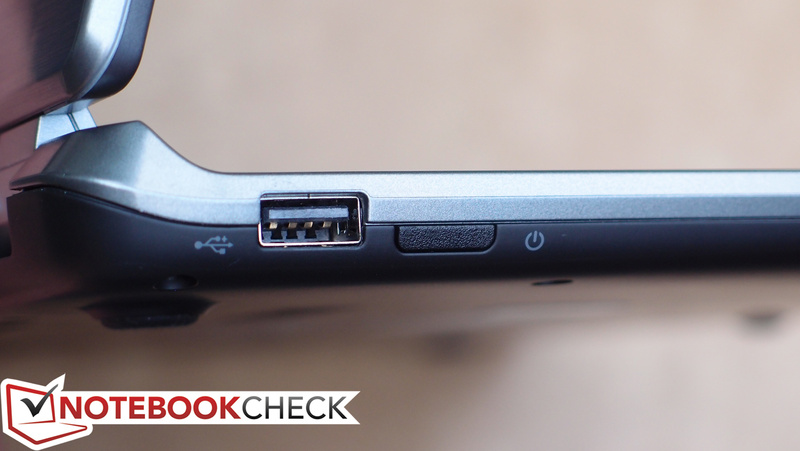 Unfortunately, only one of the USB ports is 3.0, which is a bit disappointing. Still, for a consumer-grade 15-inch Ultrabook, this isn’t a bad selection. What’s not as great is their placement. 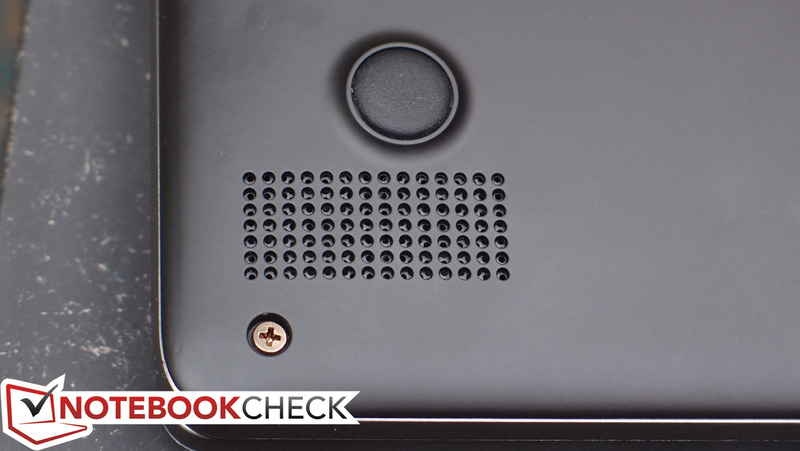 Most of the ports are banished to the back of the unit, forcing the user to reach around to them to connect devices—or, most likely, to get up and glance at the back of the unit to find the correct port. They’re also crammed together, such that connecting a mini-DisplayPort cable and a larger USB device, for instance, may be a problem. At least it improves upon the Aspire M5-481PT-6644’s situation, however, which saw all of its ports in that location; the V7 features two of its USB 2.0 ports on the sides of its body (one on each side near the back). The Aspire V7’s Intel Dual Band Wireless-N 7260 2x2 802.11n WLAN adapter provides for speeds up to 300 Mbps (over dual streams), and it performed well in our time with the unit, securing good reception at reasonable distances from the router. Also available is a Realtek Gigabit Ethernet port. The last member of the wireless trio is Bluetooth 4.0, which is integrated into the Intel WLAN card. Finally, an HD webcam rests above the screen, and throughout our brief tests, its video quality seemed adequate. 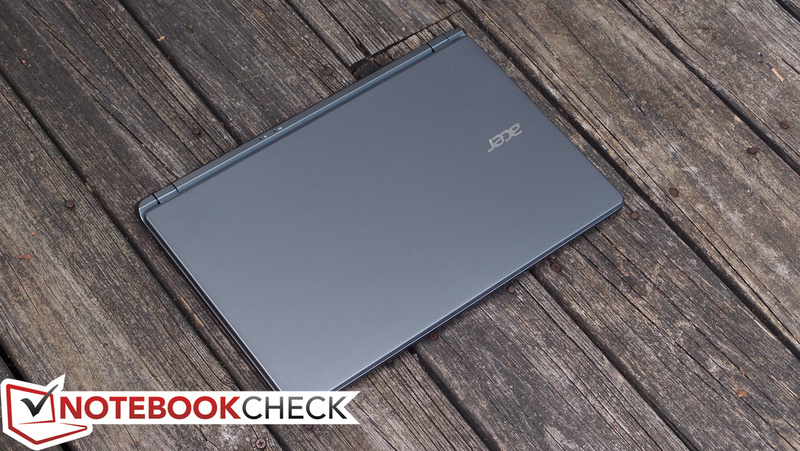 As with Acer’s other mainstream consumer notebooks, there are no special accessories in sight for the Aspire V7. 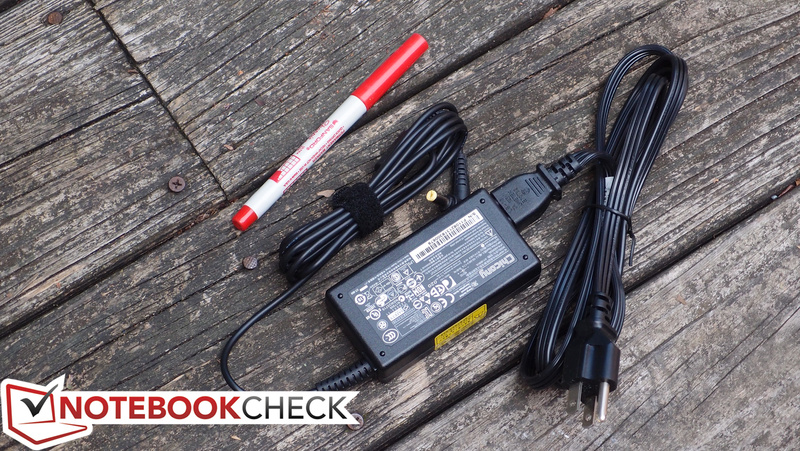 In the box you’ll find a small power adapter (weighing in at just under 0.35 kg) and nothing else. 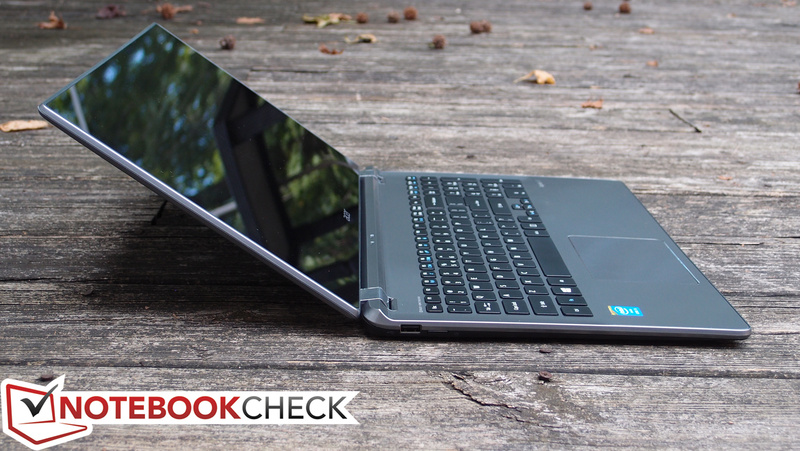 The notebook ships with a 1-year parts and labor warranty (mail-in or bring-in). ...though key travel could be much improved. 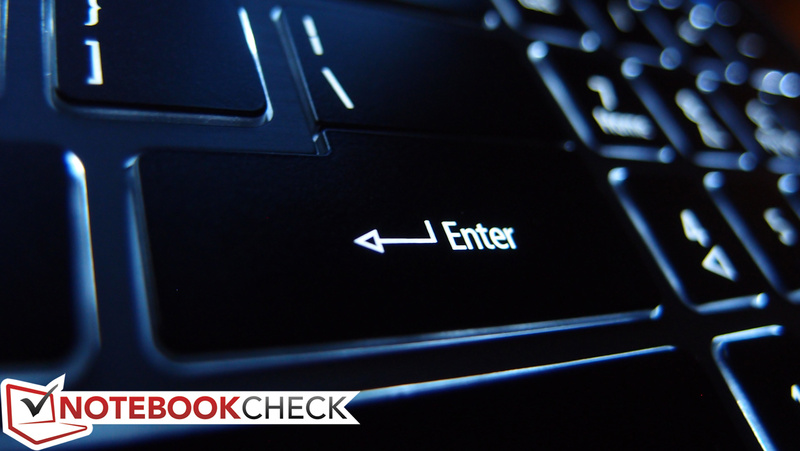 The Acer Aspire V7’s full-sized Chiclet-style keyboard features a stylish, understated appearance. 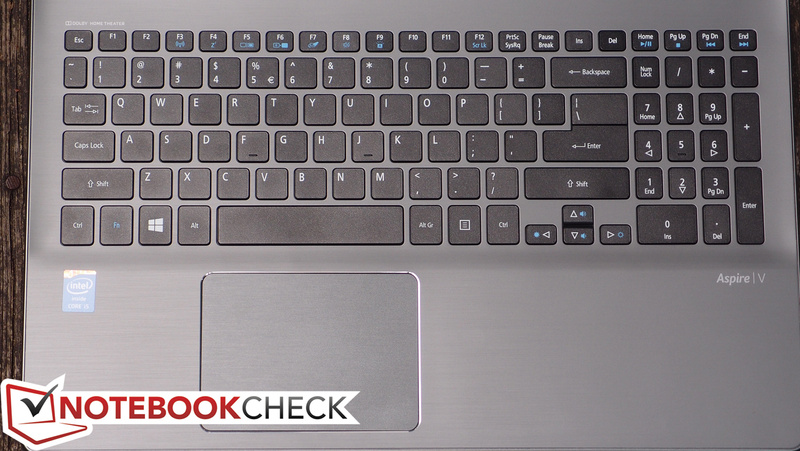 The keys are entirely flat and smooth, with a soft-touch finish that isn’t unlike the one on the bottom of the notebook. They’re spaced comfortably so as to reduce typing errors, and we had few problems finding our bearings while using it. As with many 15.6-inch notebooks, there’s a separate number pad included as well. Most of the keys are also sufficiently-sized. The typing experience, meanwhile, isn’t quite as flawless. The keys unfortunately feature a short and unsatisfying sense of travel, which renders rapid typing a bit less comfortable. The crisp stop and relative ease of stroke, however, rescue it from what would otherwise be sheer mediocrity. 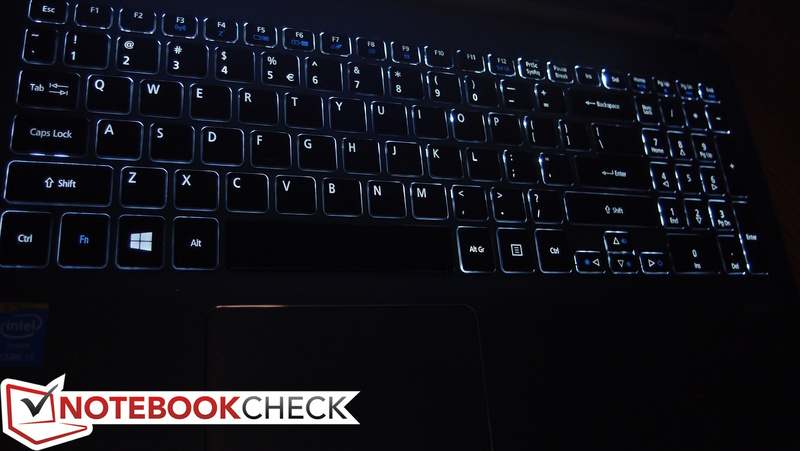 Lastly, the keyboard is backlit, which is always a plus. While it’s nice, however, there is only one brightness setting, with no supplemental ambient light sensor to help automate its operation. 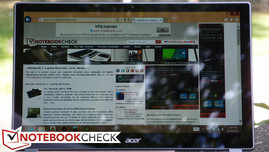 On the other hand, we have few complaints about the V7’s very good Synaptics clickpad. Not only is it easily large enough to span the breadth of the screen (even on slower pointer speed settings), it also features a comfortable smooth finish that provides for easy finger gliding across the surface—though things do get a bit sticky when any humidity is introduced. The pointer operation is accurate and consistent. Multitouch gestures also went smoothly, with the full gamut of Synaptics options available in the driver software. The only significant complaint we have is a common one: we found that the integrated buttons require a bit too much effort to depress, which renders them much less convenient than simply tapping to click instead. 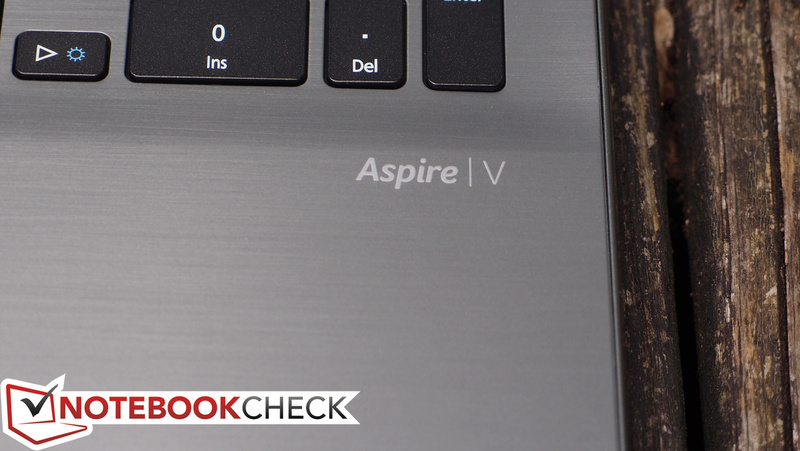 Seeing as it’s a new requirement of the revised Intel Ultrabook specifications (something which has provoked the ire of many fans of matte notebook screens), the Aspire V7 also features a 10-point multi-touch screen. We’re happy to report that it serves as an excellent accompaniment to the other input methods, with quick response, accurate operation, and good handling of multi-touch gestures. We tested input with all ten fingers simultaneously and encountered no problems. 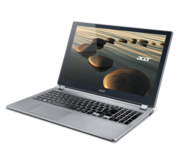 Acer Aspire V7 models are available in 14-inch and 15.6-inch varieties with either 720p or 1080p display panels, with models featuring the latter higher-resolution panel costing upwards of $1,000. 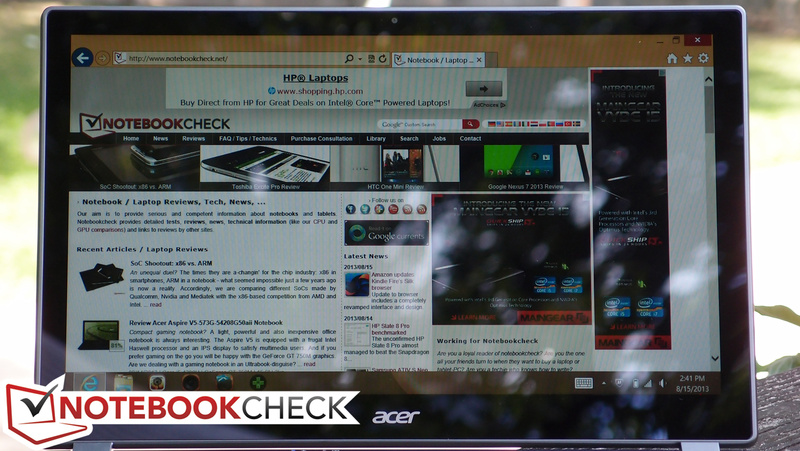 Our review unit was the $849 Acer Aspire V7-582P-6673, which includes a 15.6-inch 720p (1366x768) TN LED glossy display panel. That adds up to just 100.5 PPI, which is thoroughly unimpressive by today’s Ultrabook standards (many modern Ultrabooks post figures above 170 PPI). Likewise, upon first glance, the panel’s brightness, contrast, and color reproduction all appear subjectively unremarkable and flat. The fact that a much better (1080p IPS) panel is available for $200 above the 582P-6673’s MSRP (see the V7-582PG-6421, which also features dedicated graphics and a larger hard drive) leads us to recommend that buyers think seriously about their needs before committing to this 720p panel. Our measurements of the panel reaffirm our initial impressions. With an average brightness of just 202 cd/m², the V7 doesn’t have a dim panel, but it’s hardly in the same ballpark as most other Ultrabooks. 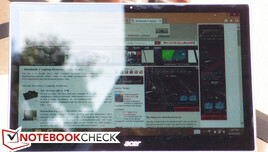 Meanwhile, its unimpressive contrast ratio of 225:1 doesn’t help matters much (many other Ultrabooks, including those we’ve chosen to compare with in this article, easily achieve above 500:1). At least the brightness distribution is relatively consistent at 92%. 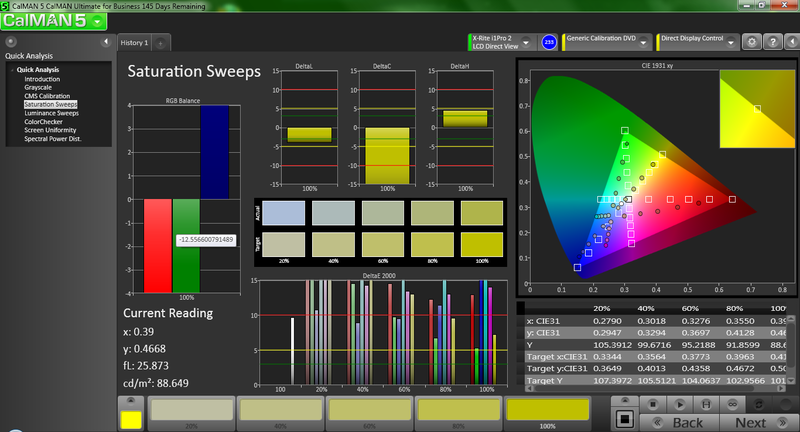 Our color reproduction measurements offer little solace. The V7 manages just 56% sRGB coverage, which is makes it completely unsuitable for any sort of professional photo editing, and results in an overall washed-out appearance. 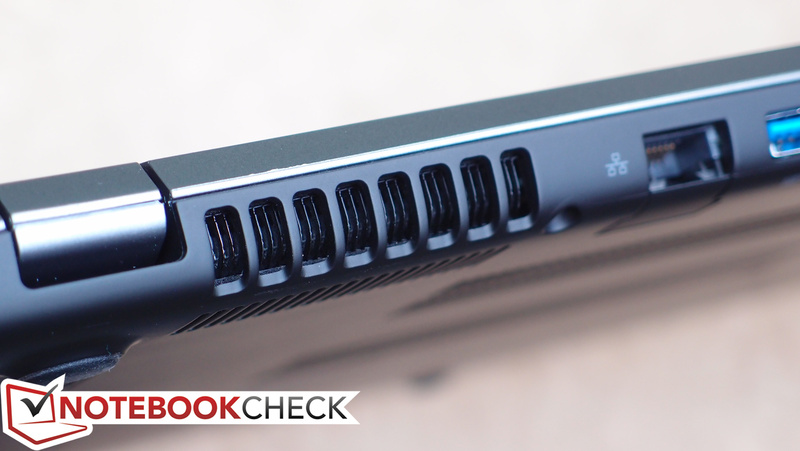 This result can’t compete with that of most other Ultrabooks in its class, which generally opt for much higher-quality panels. Fortunately, the 1080p IPS option on the V7 would most likely quell these issues (though we can’t know for certain until we’ve had the chance to assess one for ourselves). CalMAN 5 piles on with its revelations of significant DeltaE 2000 deviations across nearly all colors. 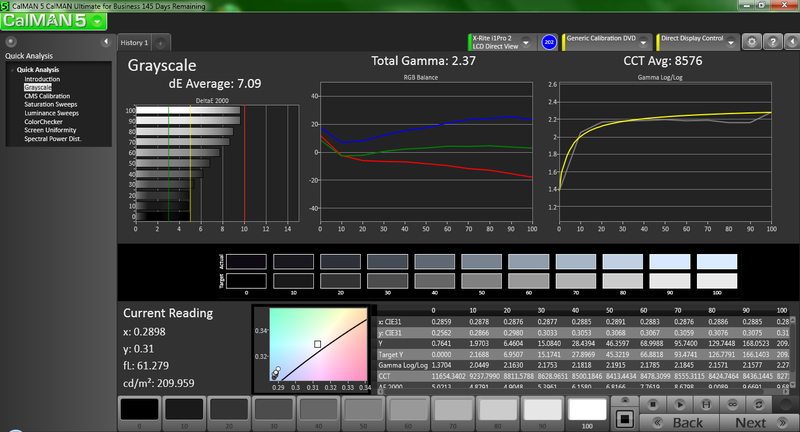 The average pre-calibration dE2000 of 12.36 tells the story: this is not a notebook meant for color accuracy. Thanks to its poor contrast, middling brightness, and glossy screen, our Aspire V7 review unit struggled to produce a usable picture outdoors. The situation is manageable in shady areas, but it quickly gets out of hand as soon as any bright sources of light are present, with both reflections and rampant fingerprints taking over. 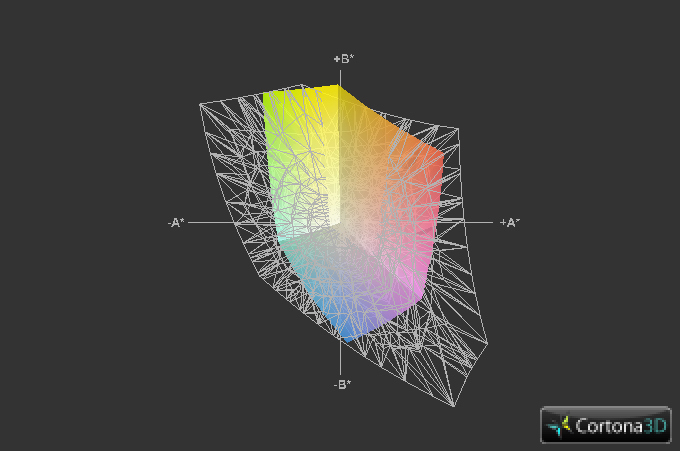 Finally, viewing angles are acceptable on the horizontal axis, sans the aforementioned reflectivity woes. However (as the presence of a budget TN panel might have insinuated), vertical viewing angles are immediately restrictive. As we’ve mentioned multiple times before, if this is a concern for you, you’d once again be much better served with the 1080p IPS panel instead, as that technology provides for very wide viewing angles with very little distortion. 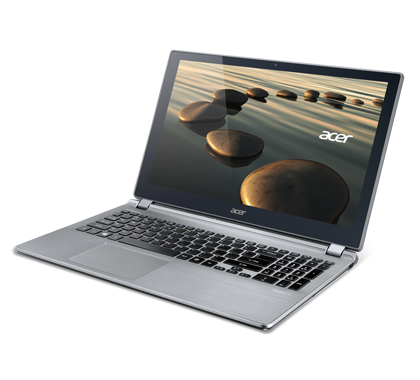 The Acer Aspire V7 models are available with a range of CPUs, starting with the least-expensive Ivy Bridge-based 1.8 GHz – 2.7 GHz Intel Core i5-3337U and topping off with the Haswell-based 1.8GHz – 3.0GHz Core i7-4500U CPU. 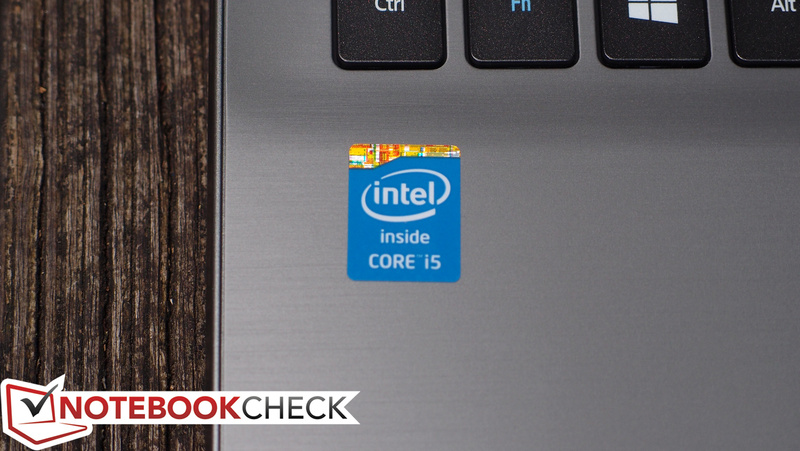 Our review unit came configured with an Intel Core i5-4200U CPU, which is also a Haswell-based chip built with 22 nm manufacturing technology. It features a base clock rate of 1.6 GHz and, with the help of Turbo Boost, can increase to 2.6 GHz when conditions warrant it. All of the CPUs available in the V7 line, including the i5-4200U in our unit, are ultra-low-voltage processors with a TDP of 15 W. This is 2 W below the TDP of comparable Ivy Bridge predecessors. 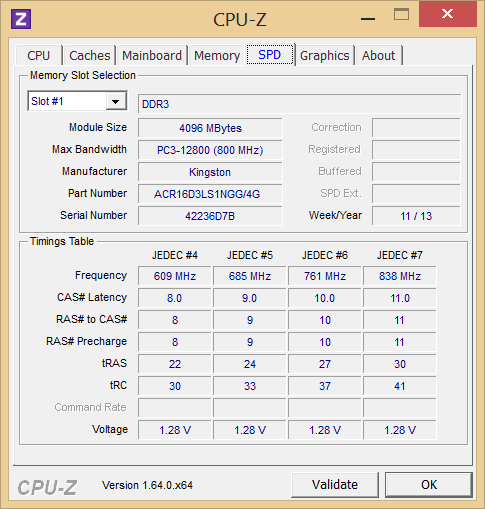 In terms of system memory, our V7 review unit featured 8GB DDR3-1600 (PC3-12800) RAM. 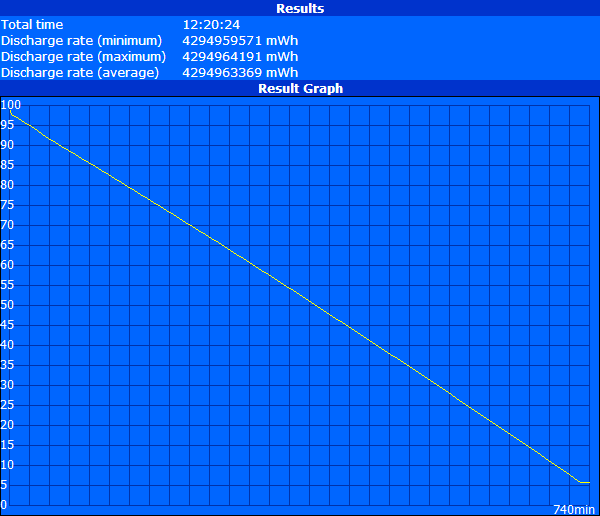 Of this total, 4 GB is soldered permanently to the system board, while the other 4 GB is a replaceable SODIMM. A grand total of 12 GB is possible if the 4 GB module is replaced with an 8 GB SODIMM. 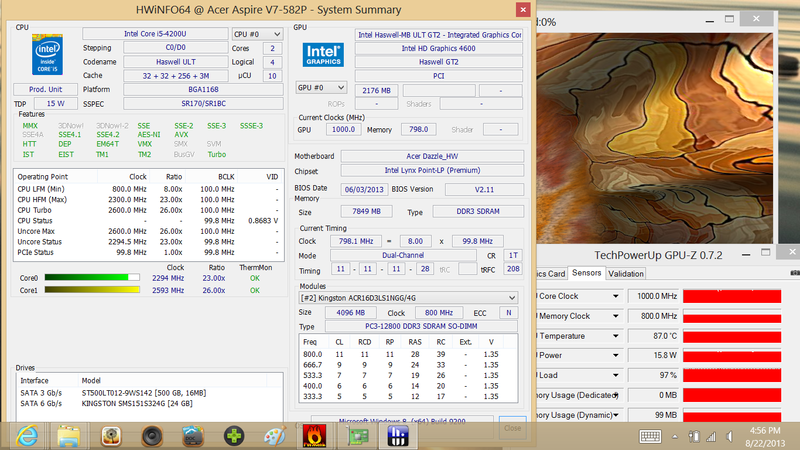 As compared to other notebooks with the same CPU, the Aspire V7-582P-6673 nearly always comes out on top. Our synthetic benchmarks place it up to 5% above the Vaio Duo 13 SVD1321M2E and Vaio Pro 11 SVP121M2EB.G4 in the Super Pi 32m and wPrime 1024m tests, and 3DMark 06 CPU reinforces those results. Meanwhile, Cinebench R11.5 widens the gap even further, with the Vaio Pro 11 falling 11% behind in the xCPU benchmark (in this same test, however, the Vaio Duo 13 scores nearly identically with the V7). To check whether or not the Aspire V7 could churn out the same level of performance while operating unplugged, we conducted a second run of 3DMark 11 while running on battery power only. 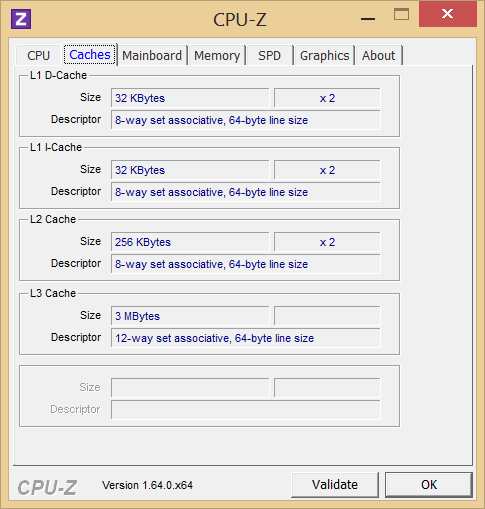 The resulting score of 995 suggests that there is no discernible difference in performance under either power state. 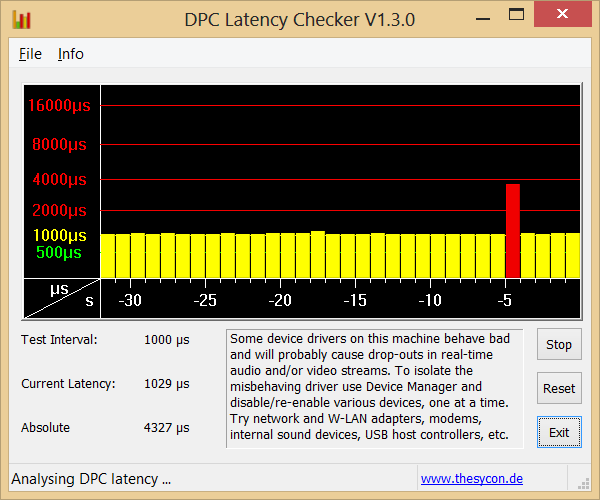 Finally, we ran DPC Latency Checker to evaluate the notebook’s propensity for handling real-time audio and video streaming. As shown in the screenshot, we experienced occasional spikes in latency (at seemingly random intervals between 45 and 60 seconds duration). Disabling wireless and other devices did not resolve the problems. Still, the spikes are so irregular that it is unlikely to manifest itself as a major problem in practice. 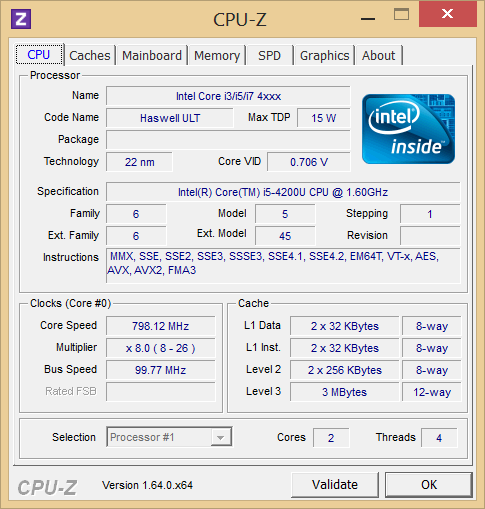 The performance of the Intel Core i5-4200U is most comparable to that of the Ivy Bridge Core i5-3317U; that’s in spite of the fact that the 4200U is clocked 100 MHz below the 3317U, and that it features a TDP of 2 W less. The two CPUs nevertheless post nearly-identical results across all benchmarks, which is an encouraging result if you happen to be more interested in battery life than CPU performance gains (which is probably true for most consumers). The bottom line is that the Core i5-4200U should provide more than enough power to satisfy most users while managing power more efficiently than equivalent Ivy Bridge CPUs. 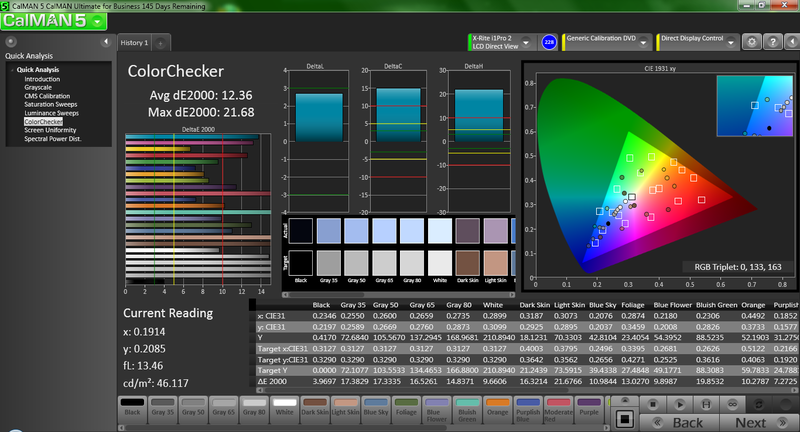 To measure overall system performance, we use PCMark. 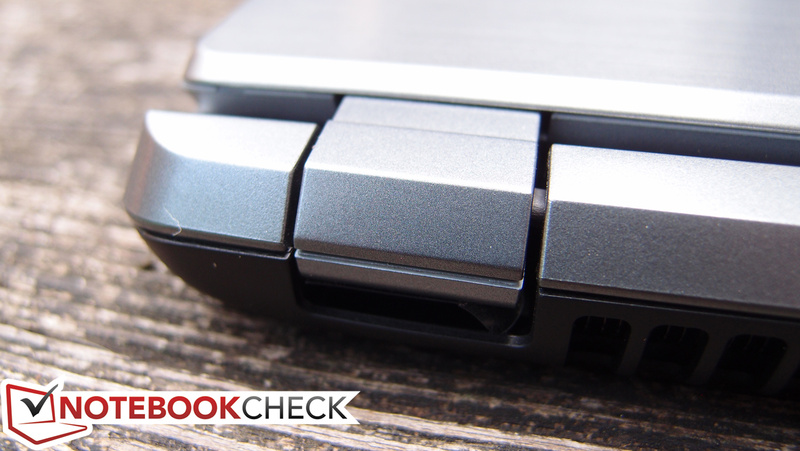 Since its performance is still bottlenecked by a conventional mechanical hard drive, the V7 can’t be expected to compete in these tests with other Ultrabooks that leverage solid-state storage devices only. 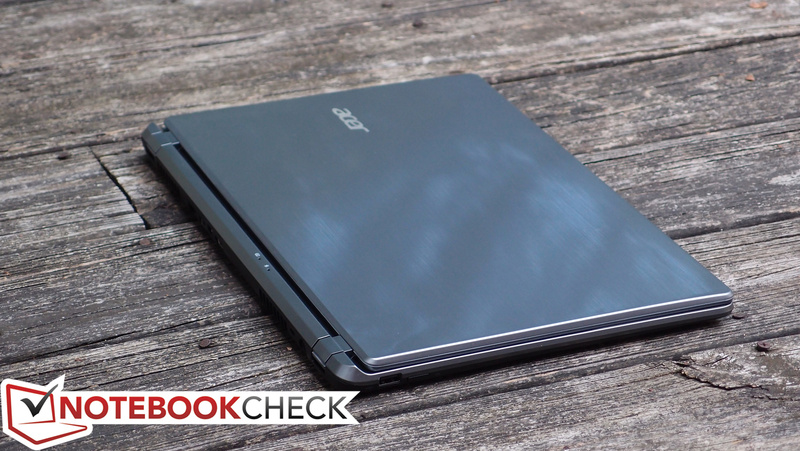 However, like many other lower-cost Ultrabooks, in order to meet the requirements of Intel’s specification, it still includes a solid-state drive—but for caching rather than dedicated storage. The end result of this approach is quicker access to and loading of frequently-used data and applications. We performed each of the system performance benchmarks three times to allow the caching mechanism to do its job before recording our scores. In PCMark 7, our score of 3841 is very good overall, breaching the top third of our database and accompanied by other machines that leverage similar technologies beyond the constraints of mechanical-only storage. The same goes for PCMark Vantage (6361), where the overall position falls to merely the upper half. 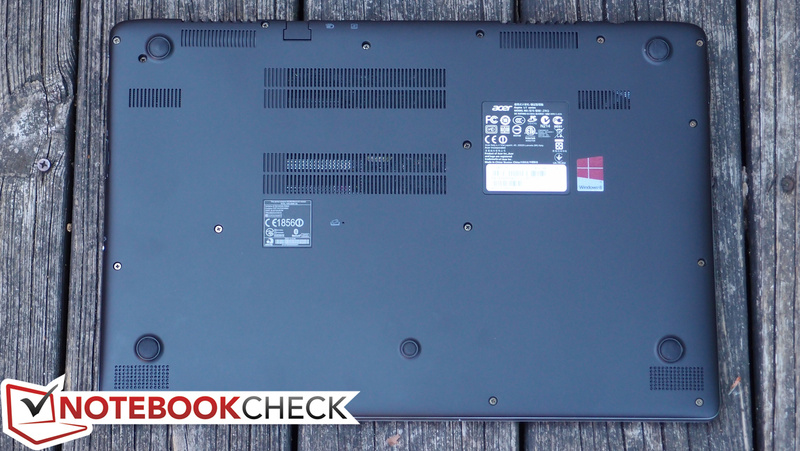 The two Sony Vaio Ultrabooks (the Duo 13 and the Pro 11) that we referenced earlier come out far ahead in these benchmarks thanks to their wholly solid-state storage configurations. In other words, it’s important to remember that, while caching certainly helps, there is no equal to a purely solid-state approach. As we touched on above, the V7 leverages a hybrid storage approach that involves a standard mechanical drive supplemented by a solid-state cache drive. 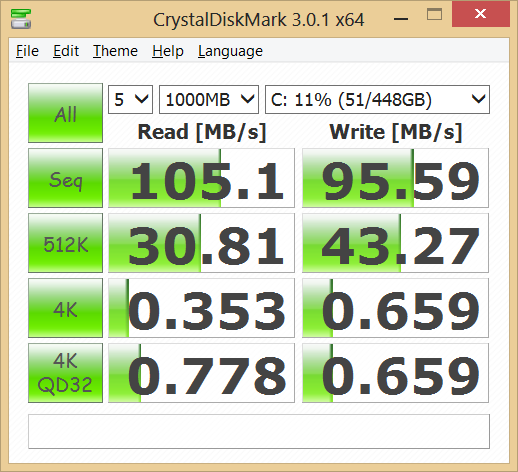 The mechanical drive we received in our review unit was a Seagate ST500LT012-9WS142 500 GB 5400 RPM hard drive; this drive was paired with a Kingston SMS151S324G 24 GB SSD (strangely, Acer reports its capacity at 20 GB instead). The Kingston SSD is used to cache frequently-accessed data so that it can be fetched more rapidly upon subsequent retrieval. This caching mechanism is totally transparent to the user. As for other storage options, not much else is available on the V7 series. The SSD size and function remains the same across all models, whereas the mechanical drive ranges in capacity from 500 GB (such as in our review unit) up to 1 TB—all 5400 RPM models. 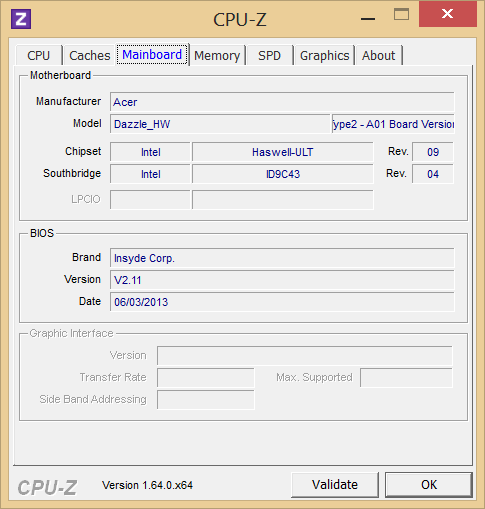 Our Aspire V7 came equipped with the standard integrated GPU for Haswell-based ULV CPUs—namely, Intel HD Graphics 4400. Paired with the Core i5-4200U CPU in our unit, this GPU’s clock speed ranges from 200 to 1000 MHz, and it isn’t likely to handle any serious gaming—though hopefully it can at least best scores from equivalent Ivy Bridge-equipped predecessors. Fortunately, this seems to be the case. The 3DMark 11 overall score of 964 is a triumph for integrated ULV graphics (and even standard voltage IGPs until now), standing alongside such respectable competition as the AMD Radeon HD 7570M (avg: 932) and the GeForce GT 540M (avg: 993). These scores are far beyond that of even the Intel HD Graphics 4000 standard-voltage GPU results (avg: 604), though they can’t hold a candle to the excellent scores managed by the HD Graphics 5000 machines (avg: 1112). 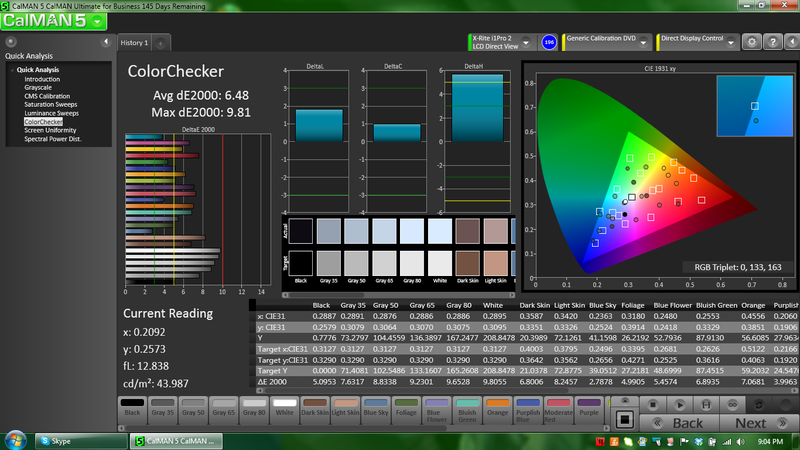 Cinebench R11.5’s OpenGL benchmark offers an even more distilled view of the GPU performance, and here, the 4400 manages a shocking 19.68—a performance (until now) unheard of in ULV integrated graphics territory. Our gaming benchmark results follow suit. While it would certainly be wiser to upgrade to one of the dedicated graphics models if you’re planning on any moderate to heavy gaming, it’s good to know that even the ULV integrated graphics of our review unit should be able to handle Low settings on most modern titles without too much trouble (and some games, such as the two we tested, on Medium). As it compares to the competition, the Sony Vaio Duo 13 (which, again, shares the same CPU and GPU) falls within a couple percentage points on nearly all relevant benchmarks, while the Vaio Pro 11 is handily crushed, most likely due to some throttling we encountered while testing it. 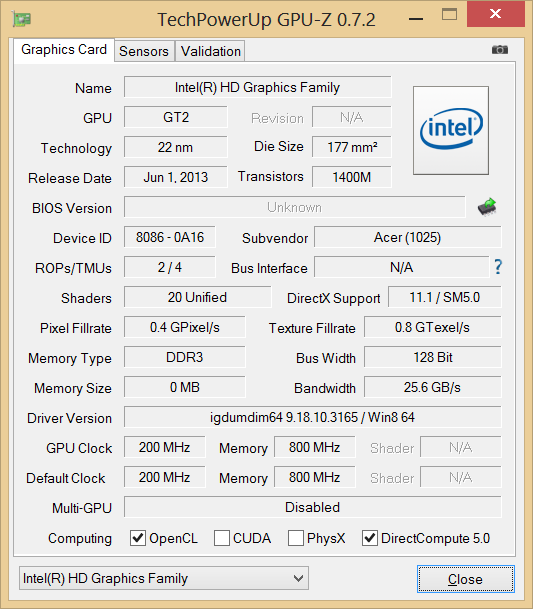 Overall, we’re impressed with the integrated GPU performance of the Aspire V7-582P-6673. 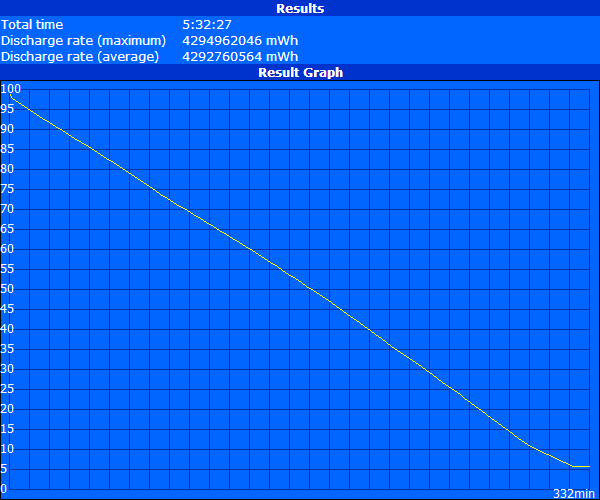 When idle, the Aspire V7 is practically silent, maxing out at 30.9 dB(A) by our measurements. Meanwhile, even load noise levels are not terribly bothersome, with a median recorded value of 36.6 dB(A) and an overall maximum of 45.9 dB(A). Even when the fan reaches this absolute highest RPM, it benefits from a tone that is not disturbing—more whoosh than whistle—and the fact that the vent is rear-mounted helps to direct the noise away from the user as well. In spite of its relative quietness, the V7 also manages reasonable temperatures, even when under load. The hottest part of the notebook was the underside of the base unit, and it still managed a thoroughly reasonable average temperature of 36 °C. The maximum recorded temperature (44.2 °C) was in the upper-left quadrant of the bottom of the notebook (upper-right while the notebook is sitting upright), and while that’s not comfortable while sitting on the lap, it’s hardly worth getting concerned about. 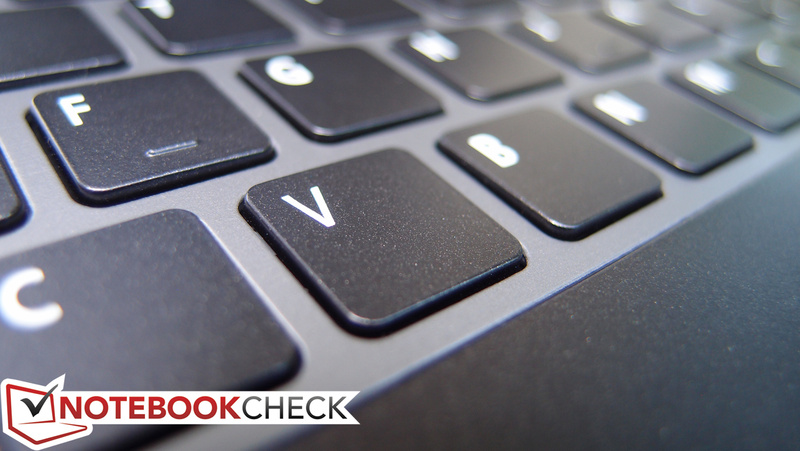 As part of our rigorous test routine here at Notebookcheck, we subject each and every PC to a stress test to see whether it can handle heavy operation without resorting to throttling. During this test, we monitor the system as it's subjected to heavy load by way of Prime95 (for CPU stress) and FurMark (for GPU stress). 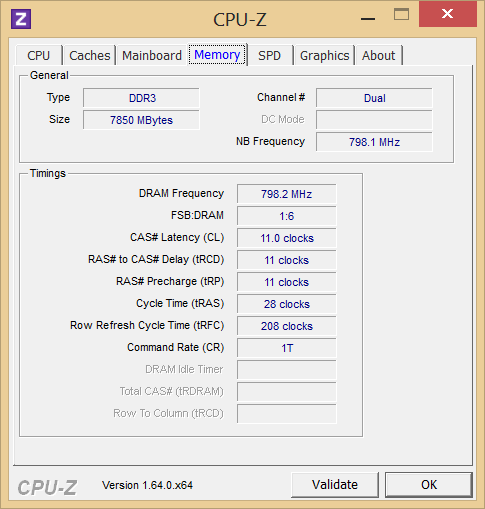 Under our full CPU stress (using Prime95 only), the notebook easily manages full Turbo clock speeds of 2294 MHz consistently. Under full GPU stress (using FurMark only), we found nearly consistent GPU operation (practically solidly locked at the Turbo frequency of 1000 MHz), which was reassuring. Finally, under full system stress (both CPU and GPU maxed out), the system finally begins to buckle to meet the design constraints of the 15 W TDP. 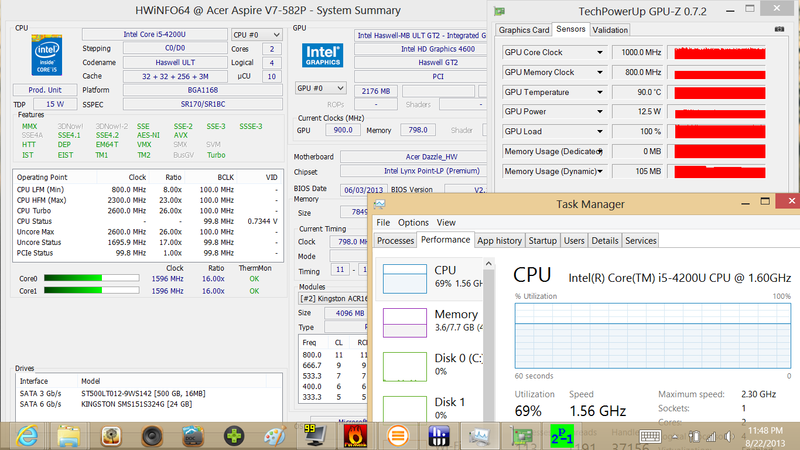 Here, we see the CPU clock locked at its base frequency of 1.6 GHz, while the GPU wavers between 900 and 1000 MHz. Since none of these values fall below the base frequencies (only the Turbo frequencies are missed), however, there is (by definition) no throttling in sight. It’s important to mention that very few machines can actually handle full system stress and maintain full Turbo frequencies. This isn’t a concern because it’s not likely for such conditions to ever manifest under real-world circumstances. To illustrate this point, we performed yet another run of 3DMark 11 directly after an hour of full system stress—and the result that we received (946) was negligibly different from that of our original GPU benchmarks. Considering the thin profile of the Aspire V7, we were pleasantly surprised to find that its four speakers (all located on the underside of the base unit) churned out mostly clear sound at uncommonly high volumes. Obviously one cannot expect accurate frequency response across the spectrum from such small drivers, but the overall tone of the sound was better than expected. The inclusion of Dolby-developed post-processing software provides additional granular control over application- and task-specific audio enhancements, which include not only a 10-channel graphic equalizer but also a Volume Leveler, Dialogue Enhancer, and Surround Virtualizer. Perhaps the most interesting story of Intel’s new Haswell line of CPUs is the improvement in battery life that it brings to mobile systems. Such is the story with the Aspire V7, which manages not only performance which is certainly adequate for most users, but also what can only be considered excellent battery life. 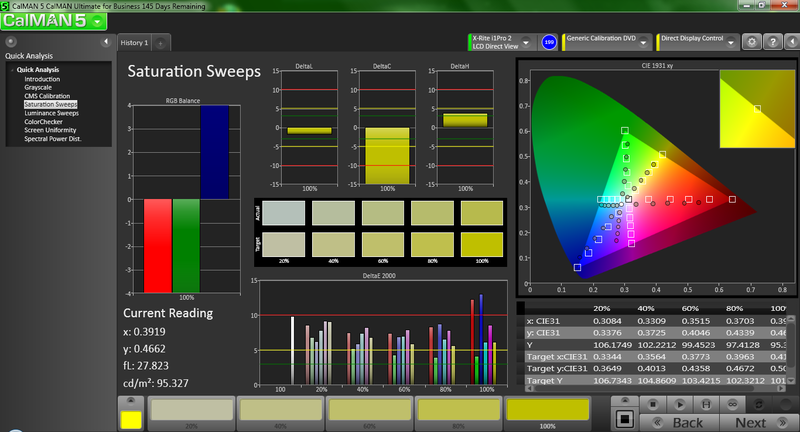 For our battery tests, we choose Battery Eater Pro coupled with a variety of configuration templates and scenarios. 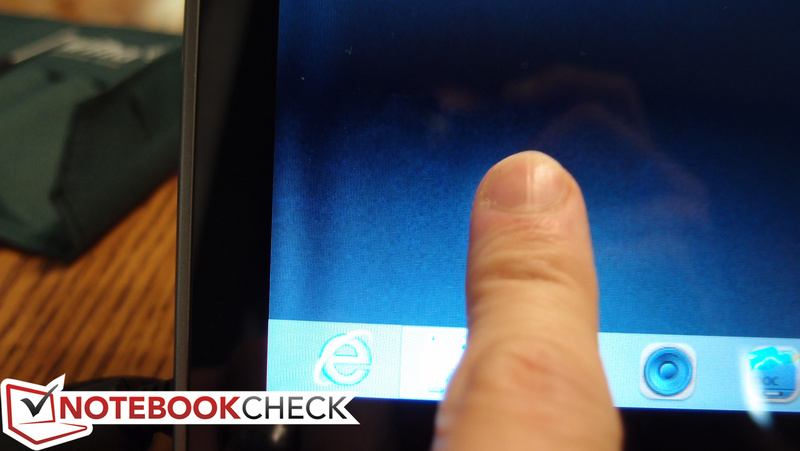 During all tests, all screen and device timeouts are disabled. 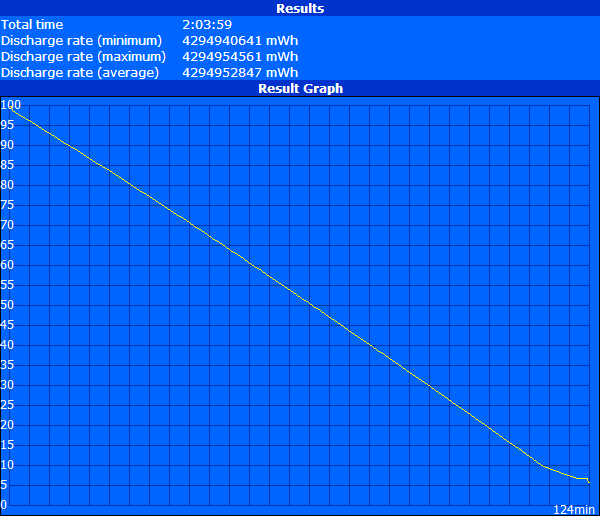 Our first battery test is used to estimate maximum battery life. For this test, we set the notebook to the Power Saver power profile, lower brightness to minimum, disable all wireless radios, and launch the Battery Eater Reader’s Test. 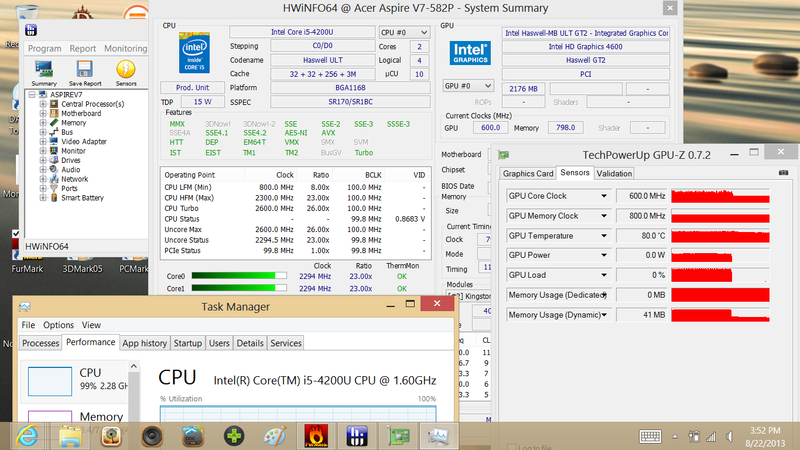 Here, our Aspire V7 test unit managed 12 hours and 20 minutes of runtime before shutting down. Next, we shift to the opposite end of the spectrum with an attempt to measure minimum battery life. 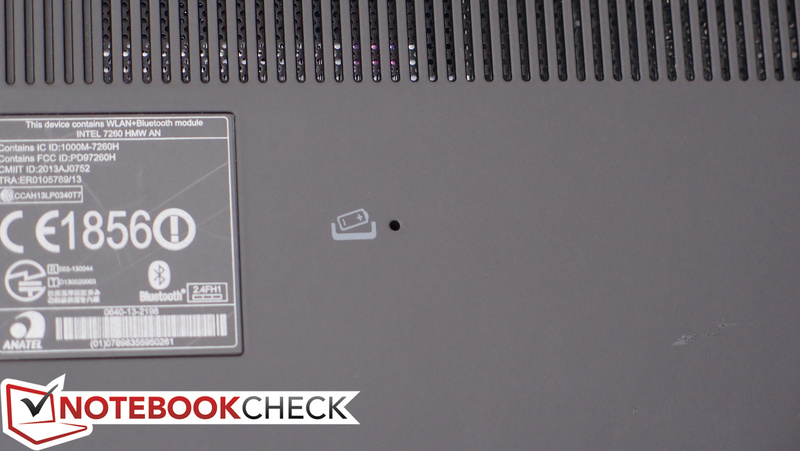 Here, we configure the notebook to the High Performance power profile, set brightness to maximum, reenable all wireless radios, and perform the Battery Eater Classic Test. Under these conditions, the notebook managed 2 hours and 4 minutes of runtime. 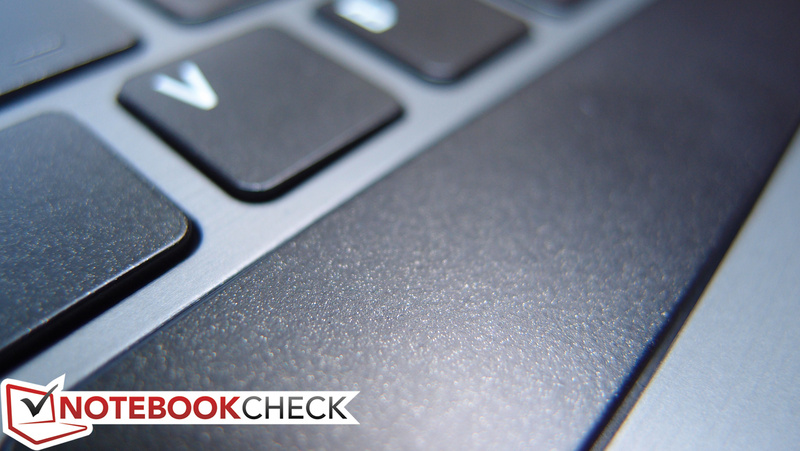 Finally, for a much more realistic approximation of the notebook’s longevity under normal usage conditions, we configure the power profile to Balanced, set brightness to as close to 150 cd/m² as possible, and launch a preconfigured web surfing script developed here at Notebookcheck. The result here was 5 hours and 32 minutes, which is yet again very good. 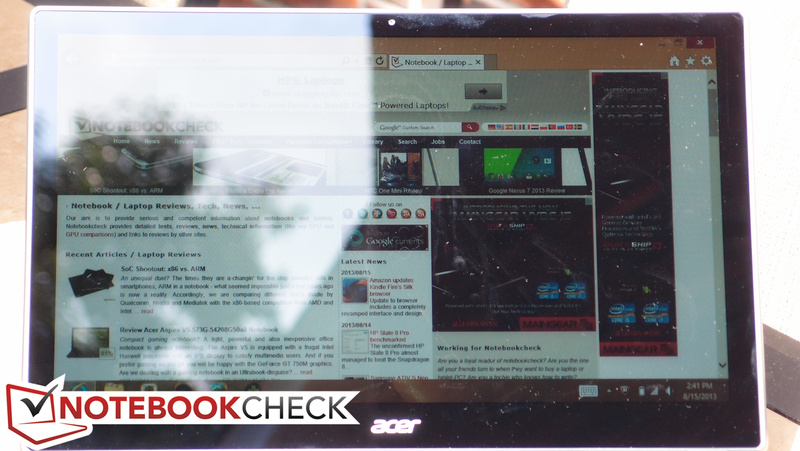 On the surface, the Acer Aspire V7-582P-6673 adds up to a solid choice: it features great battery life, an excellent touchscreen, surprisingly strong performance, and a reasonably solid build, all for an respectable price point of $849. 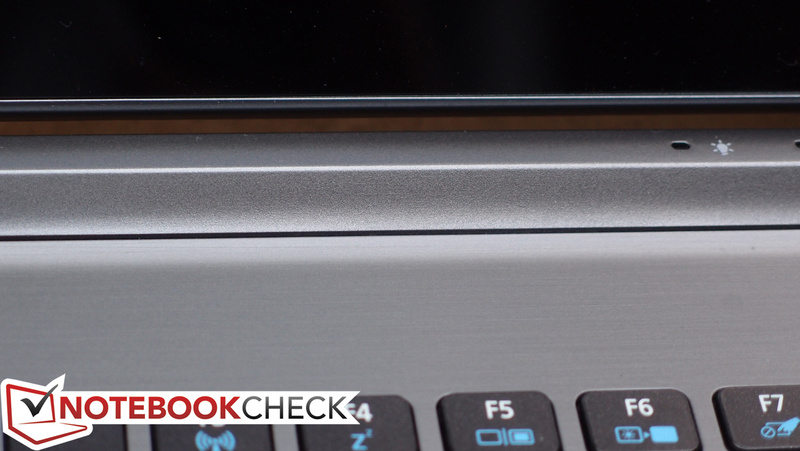 If nothing else, it’s evidence that the Haswell microarchitecture really was worth the wait: the sheer fact that a ULV-equipped Ultrabook can handle medium settings in some modern games is amazing enough. However, it features a few glaring drawbacks that overshadow many of its strengths. 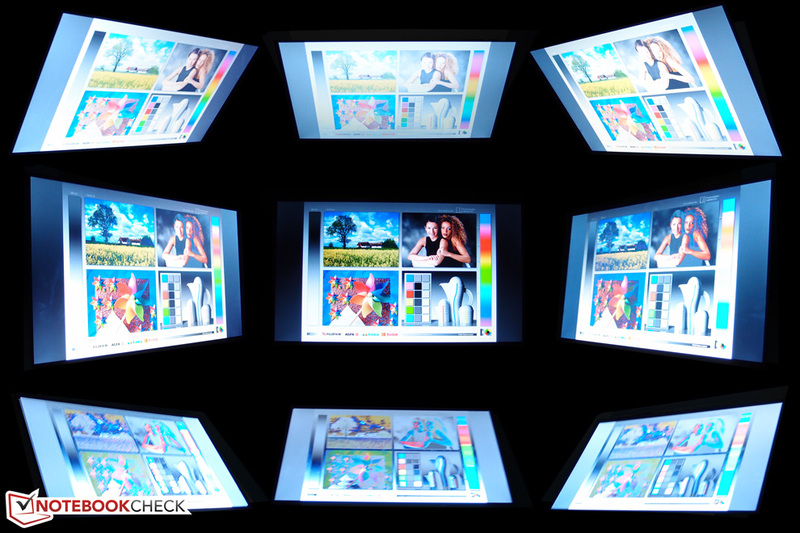 For starters, it’s hard to look past its thoroughly mediocre display, which not only is heavily reflective in moderately-lit environments, but which fails to impress in just about every other category as well (contrast, color reproduction, and resolution included). Couple that with its relatively bulky form factor (for an Ultrabook) and you begin to wonder why another model wasn’t made available that fills these gaps. 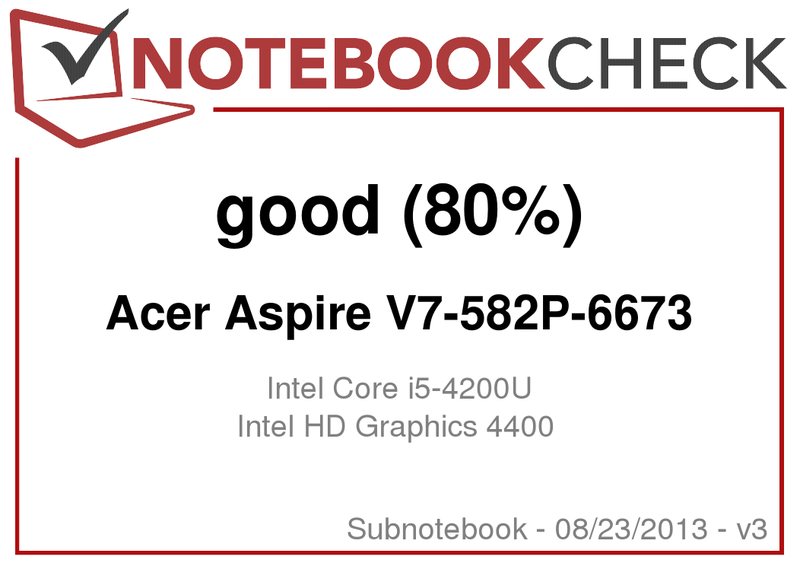 Well, it was: the Acer Aspire V7-582PG-6421, which (for $200 more) will score you a 1080p screen, dedicated graphics, and double the storage space—additions which help to justify the size premium. If you don’t mind the extra cash, this might be a better option—however, it’s unfortunate that some iterations of the notebook aren’t available with Haswell integrated graphics (for sake of power savings) coupled with the 1080p panel option. 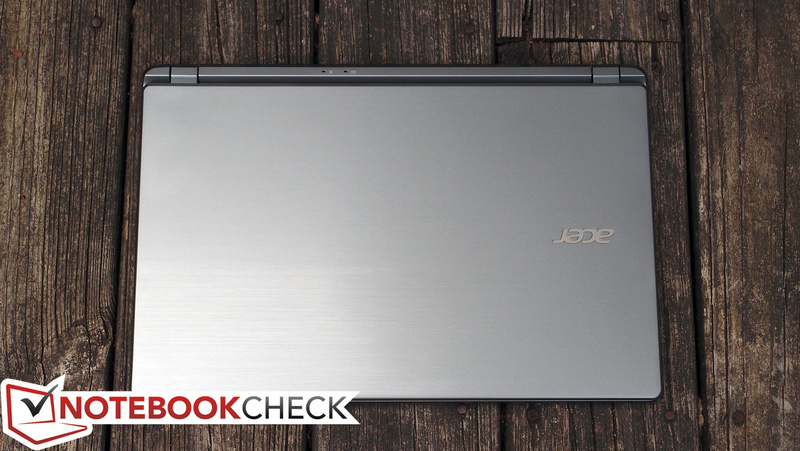 Still, if your mind is made up on a 15.6-inch machine, you’re able to look past a subpar screen, and you can live with the keyboard, the Acer Aspire V7-582P-6673 is worth considering. 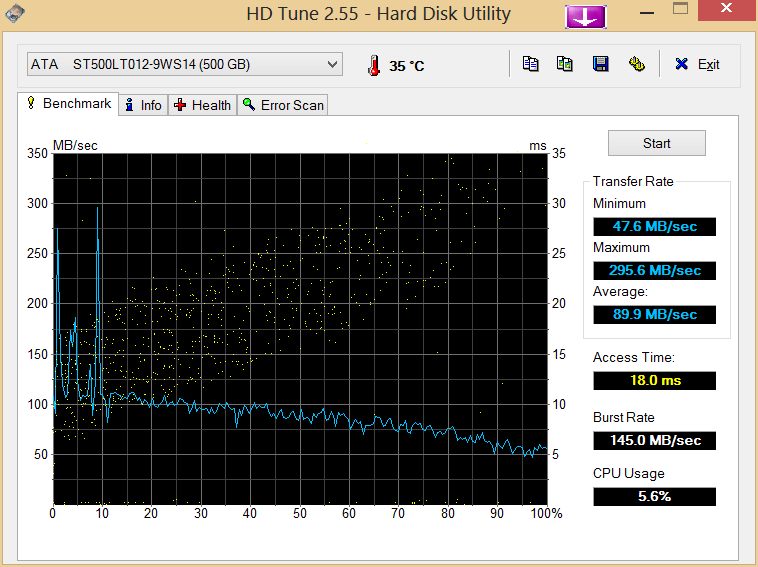 ...but still quite large in the world of Ultrabooks. The ULV GPU performance still exceeds the HD Graphics 4000 performance!